A year of no work. Eleven months of Milla in the world. She hugs fast and true. Yesterday was the best hug ever. It went on for days, it was uninterrupted, it was intense and so full of peace. Eating apple and looking proud. We're brainstorming about how she's going to be flowergirl in three weeks. I tried to talk to her about how different tomorrow would be but I couldn't speak. Winter is upon us and it's snowing everywhere and pouring here. 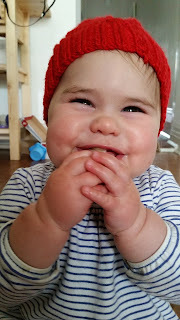 Milla at eleven months has started to do a grin where she scrunches her nose. Her top four teeth are on display. She crawled on the mat at swimming. She stands up and howls from her bed if she doesn't want to nap. She chews at her sheep toy. Loves her custom book with family pictures. Loves to admire the donkey toy. Can entertain herself pulling clothes of the couch for a good long while. Wants you to hold BOTH hands when she practises walking. Gets fed chocolate cake when I'm not around.